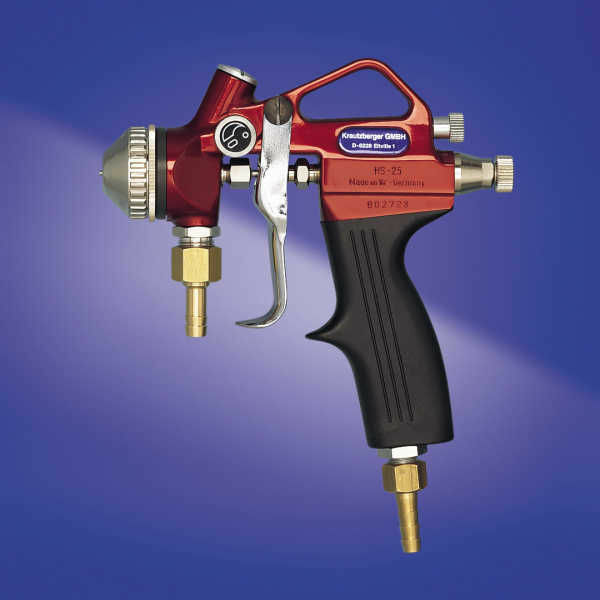 This high-performance spray gun is suitable for use with a wide range of media. The spray gun is equipped with a fine-tune air regulator as standard to allow precision metering of the air volume. The built-in jet regulating valve allows continuous adjustment from an extremely fine circular jet to a full flat jet, and this means that the jet width can be adjusted to suit different workpieces during the spraying process. The handy, well-balanced design ensures fatigue-free operation. The integrated plastic handle is also an advantage during continuous use, as it prevents the highly cooled compressed air from chilling the surface of the handle. The main element is made of an anodised, corrosion-resistant light metal alloy. The material nozzles and needles are made of stainless steel as standard but are also available in tungsten carbide, plastic etc. for special applications. There are several options for material feed. Guns are available with material connection hose nozzles or with a range of gravity cups. There is also a wide selection of nozzles and needles of various sizes. The spray gun can naturally also be used in combination with our material feed containers, diaphragm pumps and regulators. The parts of the spray gun that come into contact with the coating material are made of aluminium (housing) and stainless steel (material needle and nozzle) as well as brass and plastic (gaskets); the gravity cups are made of aluminium, copper or plastic.